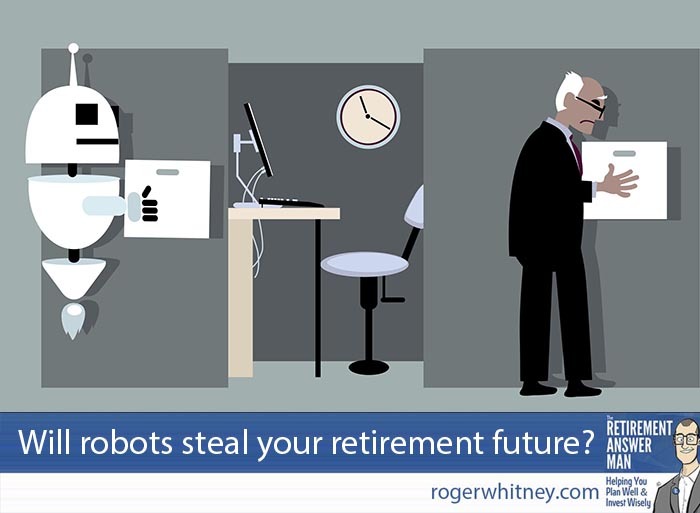 Will robots steal your retirement future? We don't know, but we can make some great guesses. Oxford researchers guess that 47 percent of American jobs could be at risk due to “computerization” over the next two decades. What’s that mean for your retirement? Should you be looking toward a massively different future as you plan for the best years of your life? Well, yes and no is the short answer. Helpful, I know. Yes, robots have stolen hundreds of thousands of jobs from the American working class, changing the markets significantly. U.S. manufacturing jobs have dropped 37 percent since their peak in 1979. Meanwhile, big digital companies are worth far more than the manufacturing companies they’re replacing while employing about 89 percent fewer workers. At least in the cross segment I looked at. The big three auto makers in 2009 had revenue of $250 billion with stock valued at $36 billion. Those companies employed 1.2 million people. Meanwhile, the top three digital companies had the same revenues of about $250 billion, but had a market cap of about $1 trillion while employing a comparatively measly 137,000 people. Sounds like big change, right? It is. But bear with me. For those of you who have followed me for a while, you know I’m a bit of a technology geek. That gets me in trouble sometimes. But as much as I like technology and recognize that the future will be different from the past and even the present, I still look to the past to plan for your future. How can the past predict the future? This topic came up after a listener of the Retirement Answer Man podcast listened to this year’s Retirement Plan Live (starting with episode 155), where I walked a couple into a possible retirement future. During those episodes, I looked at economic models dating back to 1970 to figure out where that couple should head in retirement by looking at a lot of return, risk and correlation factors through lessons of the past. My listener wondered if I should be factoring in more forward-looking consideration like – well – robots and the new speed of communications as I walk clients into retirement. The sci-fi geek in me – the one who hops on every new Apple product as soon as it’s released – wants to say that the future will be so different that the past can’t predict it. And to some extent that’s completely true. But at the same time, look at what’s happened in the past 47 years – the basis for my models. Smartphones took over the world. Nixon resigned before a nearly sure impeachment. The digital economy supplanted the industrial economy. Oil embargoes tried to stop the engine of the world. The past shows more disruptions than most can appreciate. While the changes that are coming will surely be different, there’s one constant that remains the same across the ages. Do I have tools at my disposal to forecast and predict the future? Of course. But I choose to ignore them, despite some well-meaning efforts from a lot of intelligent people. Does looking at the past have limitations? Of course. But learning from the past is more reliable than prognostications about the future. For clients like Kim and Joe, the couple I invited on Retirement Plan Live, guessing the future has to extend out about 40 years. Not only do you have such an enormous time horizon, but then you have to forecast with enough confidence to make plans through all those years. So I find and apply the best historical data available to inform my clients’ decision-making. The past never dictates the future, but it can certainly inform it. When it comes down to it, you don’t know if robots will take over the world’s businesses and leave your investment choices high and dry. That’s exactly why you can’t paint your retirement by numbers and assume the numbers will remain static. Numbers—the economy and investments—constantly evolve. The best way to deal with that is to work with a retirement planner who has planned for the volatility. If you’d like to get started with me, click here to find out a little bit about how I’m different from other financial advisors, or read this blog post about my Agile Retirement Management systems that will keep you from ever losing your retirement savings to robots. What about the future concerns you for your retirement?